Lost mines, treasures, mysterious mountains, old prospectors, Indians ... See the Introduction for an explanation of bibliographic and publishing information, as well as notes and comments. Mystery of Superstition Mountain. Irvington-on-Hudson, N.Y.: Harvey House, Inc. Publishers, 1972. Hardcover with dust jacket, 191 pages, with illustrations by Jimmie Ihms. "In their search for the Dutchman's lost gold mine in Arizona, six people are drawn together by friendship, romance, and the need to survive." Yes, that Oren Arnold. There are both trade and library editions. Trade edition. $3.95/$27.00,$12.00, all with dj. Tower house. Caldwell Id. : The Caxton Printers Ltd., 1944. Hardcover with dust jacket, 298 pages. Illustrated by Manville Chapman. First printing May 1944, Second printing December 1944, Third printing August 1945, Fourth printing, November 1946. Very attractive book. Second printing. ?/$17.50 no dj. Fourth printing. $2.50/$35 with dj. Gold Dust Kids in the Superstitions. iUniverse.com, 2010. Softcover, 380 pages. Kindle Edition, 384 KB. "Gold Dust Kids in the Superstitions is a suspense novel featuring a plot that revolves around disabled children at a ranch for equine-assisted therapy in the Superstition Mountains in Arizona. This book has humor, thrills, and a focus on the abilities and sensitivities of the disabled children, all with a Southwestern flavor and the mystery of the Lost Dutchman Mine at the forefront." Vengeance Road. HMH Books for Young Readers, 2015. Hardcover, 336 pages. "When Kate Thompson's father is killed by the notorious Rose Riders for a mysterious journal that reveals the secret location of a gold mine, the eighteen-year-old disguises herself as a boy and takes to the gritty plains looking for answers and justice. What she finds are devious strangers, dust storms, and a pair of brothers who refuse to quit riding in her shadow. But as Kate gets closer to the secrets about her family, she gets closer to the truth about herself and must decide if there's room for love in a heart so full of hate. In the spirit of True Grit, the cutthroat days of the Wild West come to life for a new generation." Missing on Superstition Mountain. New York: Henry Holt and Co., 2011. Hardcover: 272 pages. Illustrated by Antonio Javier Caparo. Softcover: Square Fish, 2012. 288 pages. Kindle: Henry Holt, 2011. 272 pages. Also: Audible edition. Book one of Superstition Mountain Mysteries. "It's summer and the three Barker brothers - Simon, Henry, and Jack - just moved from Illinois to Arizona. Their parents have warned them repeatedly not to explore Superstition Mountain, which is near their home. But when their cat Josie goes missing, they see no other choice. There's something unusually creepy about the mountain and after the boys find three human skulls, they grow determined to uncover the mystery. Have people really gone missing over the years, and could there be someone or some thing lurking in the woods? Together with their new neighbor Delilah, the Barker boys are dead-set on cracking the case even if it means putting themselves in harm's way." See the dust jacket illustration. Hardcover. $14.48 (old price: $15.99). Kindle Edition. $5.67 (old price: $9.99). Treasure on Superstition Mountain. New York: Henry Holt and Co., 2013. Hardcover: 288 pages. Illustrated by Antonio Javier Caparo. Softcover: Square Fish, 2014. 304 pages. Kindle: Henry Holt and Co., 2013. 288 pages. Book two of Superstition Mountain Mysteries. "Even though Henry Barker and his two brothers learned firsthand that the urban legend about danger on nearby Superstition Mountain wasn't just a myth, this doesn't stop them from planning their return. Along with their friend Delilah, the Barker brothers soon find themselves entangled in more danger and mystery as they uncover a real treasure, but the discovery comes at a very big price-they barely survive an avalanche. The question remains-is someone after them, or is the mountain seeking revenge?" Revenge of Superstition Mountain. New York: Henry Holt and Co., 2014. Hardcover: 304 pages. Illustrated by Aleksey and Olga Ivanov. Softcover: Square Fish, 2015. 320 pages. Kindle: Henry Holt and Co., 2014. 303 pages. Book three of Superstition Mountain Mysteries. "In the third and final book in this action-packed trilogy, the Barker brothers and their good friend Delilah secretly climb up to Superstition Mountain one last time. There are still mysteries to solve-is the creepy librarian really the ghost of Julia Thomas from a century before? What was their uncle Hank's role in discovering the gold mine? Can they still get into the gold mine after the avalanche that nearly crushed them? Does their cat, Josie, have mysterious powers? And, most of all, who is trying to kill them?" Mysteries of the Red Coyote Inn. CreateSpace, 2014. Softcover, 136 pages. Kindle edition: Island Girl Pubishing, 2014. "Want to check in at the Red Coyote Inn? You may want to check out it's shady past which includes: ghosts, sightings of supernatural creatures, and guests encountering bizarre accidents. This charming inn is nestled in the Sonoran Desert on the Apache Trail close to the foreboding Superstition Mountains which are said to be the home of the legendary Lost Dutchman Mine. Some say the inn sits at the top of an energy vortex that has ties to the mine. And this just may be the reason for all of the paranormal activity. You may find some of the guests who come to the inn are as strange as the inn itself. The inn was a gift left to a family of three - a divorced mother, daughter and son - one of those being Dean Banks, a fifteen year old boy who comes to find out he has inherited a supernatural gift of power from a long ago Apache ancestor and is destined to be the Guardian of the mine. He feels this is more of a curse than a gift. With these powers come some pretty unnatural occurrences for Dean as he acquires the ability to gain superhuman strength along with mystical powers which enable him to thwart any attempts from anyone who tries to discover the whereabouts of the mine. Dean fears his new responsibility and also is terrified of the possibility of harming someone. We also find Dean in a power struggle as he tries to remain a normal teenage boy enjoying his life riding in the desert and hanging out with his new found friends. He will befriend a mysterious old miner who holds the key to some of Dean's past . This miner also has a secret past for Dean to discover. One guest in particular is onto Dean's secrets and is out to destroy the Red Coyote Inn and possibly Dean himself." Out of the Ashes. A Dean Banks Adventure. CreateSpace, 2015. Softcover, 178 pages. Kindle edition: Island Girl Pubishing, 2014. "The supernatural thriller Out of the Ashes is Volume 2 of Mysteries of the Red Coyote Inn. Dean Banks, dirt-track biking, American Indian superhero is back and this time he is fighting an enemy, which must be destroyed in order to stop death and destruction in this paranormal thriller. He has to save the legendary Lost Dutchman Mine in Arizona and the sacred grounds in the Superstition Mountains from a powerful force only he can overcome. Being summoned as the 'Chosen One' by the Apache gods to guard and protect the land was not how he intended to spend the rest of his days. But thatâ€™s how his superpowers and knowledge from the elders and guides have been ramped up to prepare him for an unbelievable journey that may just be under his very own nose. Journey with Dean as he battles evil and is reunited with a lost love. Put on your seat belts! This supernatural thriller is a Wild Ride, full of ghosts, ancient spirit warriors, shape shifters, magic and an unexpected twist of spiritual awakening for Dean and its readers. If you love dirt-track biking, the film Windtalkers or supernatural thrillers, you will love Out of the Ashes"
Dunphy, Madeleine, and Anne Coe. Here is the Southwestern Desert. New York: Hyperion Books For Children, 1995. Hardcover with dust jacket, unpaged (32 pages), 14 color illustrations. Text by Madeleine Dunphy, illustrated by Anne Coe. From the dust jacket: "Here Is the Southwestern Desert explores the elements that build the chain of life in the Sonoran Desert. From the cactus to the hawk to the lizard to the roadrunner to the tree to the bobcat to the badger to the squirrel to the coyote to the snake to the hare, and, finally, from the hare back again to the cactus, no single one can exist without the others. Madeleine Dunphy has created a cumulative poem that gathers in all the warm and native elements that make the American Southwest such a mystical place. And Anne CoeÂ’s stunning paintings capture the magical colors that bounce off the rocks and streak the sky in the Sonoran Desert." This is a very handsome volume in a series of illustrated books for children on the natural world. 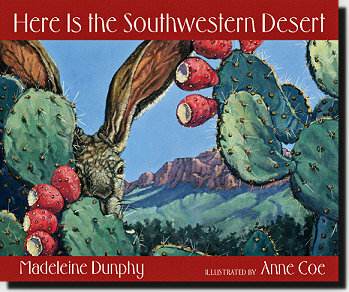 Anne Coe did the marvelous illustrations and they beautifully capture the desert landscape, its plants, and animals. Even if they don't tell you, if you know the Superstition Mountain-Goldfield area they will look very familiar. There is a new edition: Berkeley: Web of Life Children's Books, 2007. Hardcover and paperback, 32 pages with illustrations. The Ghost Miner's Treasure. Spellbound River Press, 2016. Softcover, 154 pages. The Superstitions. CreteSpace, 2012. Softcover, 346 pages. Kindle edition. 697 KB. "Like most teenagers Arizona Palmer just wanted to fit in and be a normal 16 year old. After a night in the Sonoran desert she would be anything but normal. Under the glow of a blue moon, while camping with her friends near the Superstition Mountains, Arizona is confronted with unforeseen danger which transforms her very existence in an unexpected yet profound way. Eventually she is lured back to the Superstitions where myth becomes reality and a charming, but mysterious acquaintance talks of sacrifice and destiny. Arizona is drawn to this mystery man, but questions his motives. Is he her rescuer or her adversary?" Grace Harlowe's Overland Riders on the Old Apache Trail. Philadelphia: Henry Altemus Company, 1921. Hardcover, 255 pages, with one illustration. They start their ride of the Old Apache Trail from Globe. One in a series of popular novels written for teenagers. The publisher puts it this way: "Grace Harlowe and her friends of the Overton College Unit seek adventure on the mountain trails and in the wilder sections of their homeland, after their return from service in France. These stories are of real girls for real girls." The Great Gold Hunt: Lost Dutchman's Gold Mine. bookforces, 2015. Softcover, 196 pages. "A prospector teams up with Butch Carson and his best friend Bill Cody to find gold deep in the uncharted Apache Reservation in Arizona. As soon as they arrive in Arizona they are plunged into the biggest gold hunt of their lives. They'll have to work together to defeat a sneaky rival and to find the gold field that brings them riches, all while following clues to unravel the mystery of the Lost Dutchman's Gold Mine. In Great Hunt for Gold legends and history comes alive. The endless adventure as they go gold hunting is action packed, from dangerous exploring of the Salt River Canyon through historical cliffhanger places to finding the long lost mine, there is never a dull moment. Based on actual locations and historical facts, this adventure story is told in a way as if you are a part of it. Discover compelling stories behind the history of the Apache Indians. Jack Hall tells a fascinating story about gold hunting and at the same time packs in more details about the Apache Trail, Salt River Canyon and the land of the Apache Reservation. Follow in the footsteps of Butch and how he discovers the Lost Dutchman's Mine." Lost on Superstition Mountain. Hamilton, MT: Quiet Impact, 2004. Softcover, 138 pages with illustrations. ?/$40, $30, $25, $20, $15 with dust jackets; $25, $18 no dust jacket. Indian tales of the desert people. New York: Donald McKay Co., 1957. Illustrated by William Hayes. Hardcover with dust jacket, xvi, 111 pages. A nice book for young readers telling twelve stories based on the myths and folklore of the Pimas and Papagos - much centers around Superstition Mountain (Gah-koat-kee or Crooked Mountain). Nicely illustrated. For Pima legends see: The flood on Superstition Mountain. Henty, G.A. (George Alfred) 1832-1902. The golden canon. New York: Hurst and Comp. (Federal Book Co.), 1899. Hardcover with dust jacket, xii, 223 pages. "Story for the search for a gold mine up the Salt River beyond the Verde River in the mountains to the south." (GD) In other words, the Superstitions. Henty was a popular writer of boy's adventure stories. Ghost Town. Studio City: Players Press, 1981. Reissued in 1992. Stapled pamphlet, 20 pages. This is a one-act play for children. (From Contemporary Authors: "As a playwright, William Hezlep has devoted much of his career to writing for children. In his popular "Travelers" series of nine plays, which include Ghost Town, Pharaoh's Dagger, and Treasure of the Mayans, two likeable children find themselves in the center of amazing adventures that involve magic, exotic locations, and plenty of action and suspense.") "...Erin and Dirk have traveled to the wild west to explore a real ghost town ... The children meet an old prospector, Crazy Sally. She is searching for the Lost Dutchman Gold Mine. Two nasty varmints, Boris and Lizard, are stalking Crazy Sally hoping to steal her map to the mine." All is set right by the ghost of Jacob Waltz, who tells them "Do not seek the Lost Dutchman. Better things there are in life than gold. Seek instead to lead good lives, help others, and wisely keep away from Dutchman's Gold." #2 The Superstition Mountains Treasure: Sam 'n Me adventure books (Volume 2). CreateSpace Independent Publishing Platform, 2013. Softcover, 58 pages. 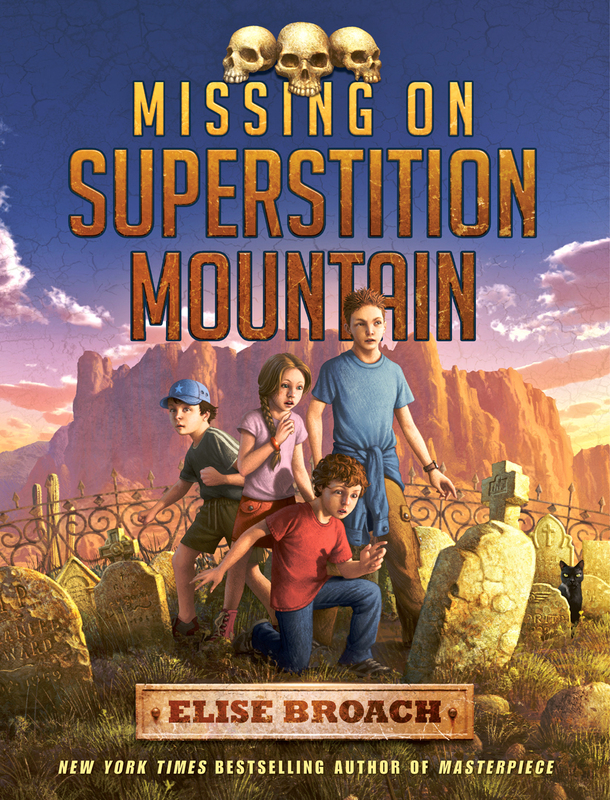 "The Superstition Mountans mystery is the next book in the adventure books series that takes Sam 'n Gramps on a search for the treasure described in the second monastary record book they found during their search for the first treasure." Superstition Mountain Baltimore: PublishAmerica, 2003. Softcover, 78 pages. Chris, Jenny, and Joe meet aliens in Superstition Mountain. I guess it is the Superstitions, the first two sentences: "An eerie sound echoed near the old Apache trail of the Superstition Mountain. Chris stopped looking for gold nuggets." Not much to recommend it. September Rose Searches for Hidden Gold. Scottsdale: lj children's books, 2004. Hardcover, (40 pages) vii, 29, and 4 unnumbered pages. Map and color illustrations by the author. From the backcover: "In this story September Rose joins with a group of kids to search for a treasure of gold rumored to be hidden by a prospector in the Superstition Mountains. September is allowed to bring her curious pet Pongo Pongo, a small young elephant, to help her look." This is a charming children's book, nicely illustrated and printed. The Kachina Doll Mystery. New York: Simon and Schuster, 1981. This edition: Minstrel Books (published by Pocket Books, a division of Simon and Schuster), 1988. Softcover, 175 pages. "First Minstrel Books printing October 1988." This is number 62 in the Nancy Drew Mystery Stories series. Nancy Drew is off to Apache Junction and the Superstitions to help her friends solve some trouble at their new resort. From the backcover: "The desert can be a deceptive, dangerous place -- especially a remote section of the Arizona desert that is haunted by the ancient Indian curse of the Kachina dolls. Nancy has come to a friend's ranch to look into the case, and all she finds is trouble." The Winged Warriors: and the Apache Junction Rough Riders. Bloomington: AuthorHouse, 2008. Softcover, 64 pages. 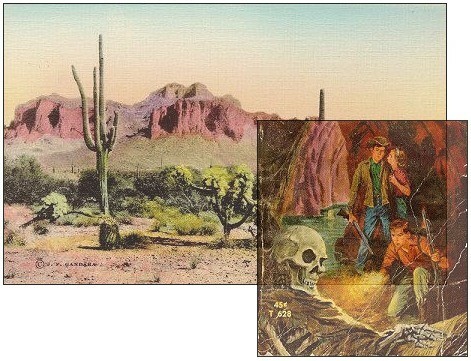 Page vii: "This story takes place in the Superstition Mountains of Arizona. Time period 1950s. Now let's get on with the story!" Back cover: "This story came to me in a dream. It happened a few months after my wife and I had taken a trip to Ariozna. It you go to Arizona you must visit the Superstition Mountains, where the Dutchman's mine is hidden! In case you haven't heard many people have lost their lives looking for it! A lot from the hands of others also looking." Treasure at Bar X. New York: Dodd, Mead & Company, 1955. Hardcover, 149 pages, with illustrations by Gerald McCann. The three authors who wrote this are Bettina Leonard Kramer, Mary Rodgers Smith, and Genevieve Walther. "Betty and Bob's vacation on a ranch near Phoenix introduces them to Indians, rustlers and the Superstition Mountains." Mystery Mountain. Philadelphia: Macrae Smith Company, 1964. Hardcover with dust jacket, 156 pages, with numerous illustrations by Barbara Werner. Calico Kate's adventures in the Superstition Mountains. Glen Haven, Scottsdale, Disneyland: Calico Kate's Pantry Shops, 1964. Illustrated by the author. Spiral bound, 33 illustrated pages. There are several Calico Kate books for little children, this one has Kate off to the Superstitions where she meets Mr. Mountain Lion, Ray Rattlesnake, Tilly Tarantula, even Homer Horny Toad. I pity the child whose parents were stubborn enough to read them the whole thing. The prospector's promise. New York: Lothrop, Lee & Shepard, Co., Inc., 1960. Illustrated by Louis Segal. Hardcover with dust jacket, 183 pages, with 12 drawings. "When Judy and Elizabeth grubstake an old prospector looking for the Lost Dutchman mine, he promises them a share of whatever he finds." The Lost Dutchman. Tucson: Reading A-Z. Booklet, 14 pages. Illustrated by Maria Voris. The publisher sells these books as downloadable files that the buyer prints and then assembles into a book. These curriculum materials are available to teachers through a yearly subscription fee. This one is a reading text written for fourth graders: Reading Level V. Word Count 3776. From the website: "The Lost Dutchman is a fictional story about two boys, Billy and Jacob, and their teacher, Mr. Martinez. The boys are learning about Arizona in the 1800s, and in particular the Gold Rush and a legend from that time. However, something goes funny, and the boys and their teacher end up searching for the gold from the legend. All is back to normal when Billy realizes he has just been daydreaming. Or has he?" Munch, Theodore W. 1919- and Robert D. Winthrop. Thunder on Forbidden Mountain. Philadelphia: The Westminster Press, 1976. Hardcover with dust jacket, 155 pages. "Kevin, his sister Marcy, and Apache 'sitter' Ramona take a tenderfoot Ohio cousin on a long hike into the Superstition Mountains of Arizona where they encounter more adventure than they anticipated." Inky, Stinky and Pinky - The Lost Dutchman's Mine (The Three Little Nickels). Amazon Digital Services, 2013. E-book, 22 pages. "Inky, Stinky and Pinky "The Three Little Nickels" is a series of short children stories focus on kindergarten through third grade students. The stories are short with a length of approximately ten pages. Each story depicts and adventure undertaken by the three little nickels. The stories are broken down into chapters that can be assimilated by children in a brief amount of time." Danny Orlis on Superstition Mountain. Chicago: Moody Press. Softcover, 128 pages. One in a series of many Christian stories for teens that Palmer wrote. It is Superstition Mountain in name only, in this story it is in Mexico. There are several different covers. Strong Head Sam: the cowgirl hero. ? : CreateSpace (BookSurge Publ. ), 2010 (2009). Softcover, 24 pages. Illustrated by Michael Calandra. "Strong Head Sam, born in the foothills of Arizona's Superstition Mountain, grew up to become a sharpshooter and to do incredible feats of bravery and strength: creating waterfalls; rescuing people in trouble; clearing boulders, to name just a few, and earning herself a reputation akin to that of Paul Bunyan." From the book: "Howdy, y'all! I'm going to tell you a story about a sixteen-foot-three-inch-tall Wild West wilderness girl named Strong Head Sam. She was born to Sammy and Nellie Strong in the foothills of Arizona's Superstition Mountain in a small cabin at the mouth of the Verde River. Even when Sam was just a little tyke, she had the eyes of a six hawks and the strength of eight buls. Sam was a chip off the old block from her father, Sammy Strong." Legend of the Superstition Gold. Createspace, 2014. Softcover, 150 pages. "People gone missing, ghost stories, legends, and The Lost Dutchman Goldmine. Danger abounds, yet twelve year old Annie and her Welsh pony, Midnight, can't wait to join the Shadow Riders in their annual overnight trek into the beautiful wilderness of the Superstition Mountains of Arizona. The trail ride she's dreamed of for so long is all she hoped for with wildlife, hidden oasis in the desert, and the stories etched in stone by nations long gone. But Annie's telepathic connection with her pony, and the pony's ability to communicate with other animals, reveal the secret protected through centuries by The Thunder God of the Apache Nation. And Annie with her pony are swept away in a rockslide. Will Annie and Midnight be doomed to forever haunt forgotten trails and join the ranks of those 'gone missing' before her?" Josh Akers Mysteries, Book 1. Frederick: PublishAmerica, 2001. Softcover, 111 pages. From the publisher: "Middle School student, Josh Akers, and his mother must go to live with Grandmother Mimi after his father dies. His mother must travel a great deal, leaving Josh and Grandmother Mimi to have many adventures together. In the first adventure, grandmother tells Josh the legend of the BlacksmithÂ’s gold. Josh and Mimi solve a mystery in their own town and uncover the gold. In the second adventure, they learn Mimi has inherited an old ranch near the legendary Lost Dutchman Treasure. Mimi and Josh, with the help an old prospector, unravel a mystery and discover the true meaning of the Lost Dutchman Treasure. In the third adventure, Mimi and Josh have the opportunity to go to Mexico, the Land of the Maya. Find out what happens when Josh Josh goes exploring and is imprisoned by tomb robbers. Can Mimi solve this mystery on her own?" Treasure Mountain. Phoenix: Century Graphics, 2001. Softcover, 135 pages. Illustrated by Catherine L'Odense. 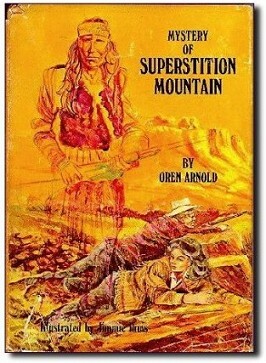 On the back cover: "Within the mysterious depths of Superstition Mountain lies the Lost Dutchman Gold Mine. For over one hundred years it has drawn gold seekers from all over the world, but no one has ever found it. When their Uncle Bob takes Chip and Tim on a "Dutchman Hunt," the brothers find the mountain is full of surprises and dangers beyond their wildest imaginations. They also learn that finding gold is not the most important thing in life." The author thanks Tom Kollenborn in her Acknowledgments and there is a strong recommendation of the book from Kollenborn on the back cover. 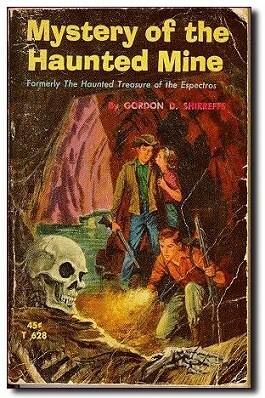 Mystery of the haunted mine. New York: Scholastic Book Service, 1965, c1962. Paperback, 252 pages. 0riginal title: The haunted treasure of the Espectros. Philadelphia: Chilton, 1962. Third printing. March 1966. A writer of westerns and children's books. Wrote Rio Bravo and many other westerns. Back cover: "The Espectros...The Haunted Mountains! Somewhere in those canyons is a fortune...thousands of dollars worth of gold that men have searched and died for. The Indians say it is guarded by ghosts - but Gary and Tuck refuse to believe that ghosts use live ammunition!" The Espectros are in Arizona, they are dominated by a formation know as "The Needle", they are rumored to contain a fortune in gold left over one hundred years ago by the Malgosa Brothers; where did he get a story idea like this? First printing. March 1965. $.45/$4.00. Third printing. March 1966. $.45/$15.00, $4.00. Scotty and the Lost Dutchman Mine. Chicago: Moody Press, 1969. Softcover, 128 pages. On the cover: "Moody Youth Library." There are a number of "Scotty and the..." titles. There are two different covers for this book. Das Gold der Apachen. Wetzlar: Verlag Hermann Schulte, 1973. Paperback (19 cm. ), 160 pages with illustrations. German language edition of Scotty and the Lost Dutchman. Translated by Erna Schulte and illustrated by Egon Schwartz. Second printing in 1975, Third printing 1978. The legend of the Lost Dutchman's gold mine. Gilbert:Sol de Oro Publications, 2004. Softcover, with photographs, illustrations and maps. The book can be purchased with either a blue cover or a golden-yellow cover, and with flat or spiral binding. The book can be ordered from Sol de Oro Publications. From the author's web site: "This is the only children's book based solely on this legend and was written by Regina Tucker in special consultation with Tom Kollenborn, one of Arizona's foremost historians and experts on this legend. It is filled with over 50 full-color photos and illustrations of the locale of this legend and of the era. It also has a copy of the map that "the Dutchman" left to his caregiver before his death and a list of the 14 clues he left that still baffle us today. There are suggested reading lists (for children and adults) in the back of the book. Additional resources listing and maps are also included in the Appendix." The mystery of the lost mine. Morton Grove: Albert Whitman & Co., 1996. Softcover and hardcover, 121 pages, illustrated by Charles Tang. One of the numerous books in the Boxcar Children Mysteries series. "On a camping trip to Arizona with their grandfather, the Alden children search for a lost gold mine." In fact, they stay at an RV park at the foot of Superstition Mountain and get captured by the idea of looking for the Lost Dutchman mine. There is some intrigue, and most amazingly, the stone maps even get a mention: "Not too long ago, some tourists found some small stone slabs with pictures carved on them. The stones were supposed to be maps, with clues to the location of the gold mine. If a person figured out the clues, they would find the mine. Like a treasure hunt." Well written, nice illustrations. The Lost Dutchman. Marietta: Discovery Press, 1989. Paperback, 140 pages. Illustrations. The missing gold mystery. Mt. Vernon: Lantern Press, 1977. 158 pages. "On a camping trip in the Superstition Mountains, three teen-age boys try to find a long-lost gold mine but discover that they have some mysterious competition in their search."